In our minds, every home should have a patio, and every patio should have a set of comfortable and delightful outdoor furniture. Taking in nature while grilling and spending time with friends and family is as American as baseball and apple pie. Here at Curly’s Furniture, we give you the chance to keep with a modern tradition, by offering affordable outdoor furniture that is stylish, and designed to last a lifetime. 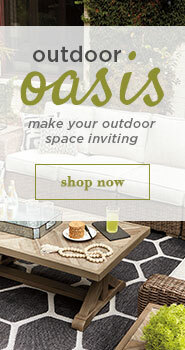 No matter what your budget, we are sure to have the outdoor furniture that’s right for you. 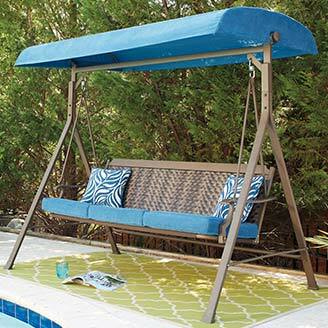 Find huge savings on outdoor lounge sets in your choice of colorful fabric upholstery, and base materials from metal to wicker. Cozy up with your sweetheart on a tufted loveseat, or make your neighbors jealous with an outdoor modular sectional, arranged to your heart’s desire. Choose an outdoor furniture set with a classy center table to really keep things casual and carefree. For dinner time, choose our four- to six-seat outdoor dining tables with comfortable padded chairs. 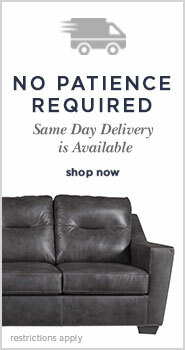 Select from stationary or swiveling chairs, in metal or wood, in your choice of finish or stain. With outdoor seating like this, you’ll want to fire up the grill even when it’s winter. After lounging in the late afternoon sun, or feasting on delicious barbecue, it’s always nice to catch the last few glimmers of daylight while lighting an inviting fire. With our selection of gas-powered fire pits, you can really bring your friends and family together as you sit around on accompanying lounge chairs. Choose from transitional or rustic designs, and while away the hours with conversation and stargazing. If you’re looking to keep warm without a full open flame, however, we also carry an assortment of outdoor patio heaters. The heat they produce is just as comfortable, and they don’t require much floorspace. Either option will prove to be a welcome addition to your outdoor seating and dining. If outdoor furniture is next on the list for your home furnishing goals, then look no further than Curly’s Furniture. Located just outside of Chicago in DeKalb, IL, our home furniture store has everything you need to make your next outdoor party a real hit.